About a week ago, Natural History Museum (London) emailed to let me know they were going to be asking people on Twitter to come to the museum for a ‘special’ mission. Immediately intrigued, I waited for more information. I didn’t have long as I soon found out they were asking people who love the museum to come in on July 20th to be filmed. But that’s all that was said. Sadly, getting to London is not an easy task so I wasn’t sure I’d be able to go but, luckily, it was offered that I could film Charlotte and I, then send it into them. So on July 20h, I arrived in London in time to meet with the other Tweeters who responded to the Museum’s quest for volunteers. We were given a bit more information – but not much. 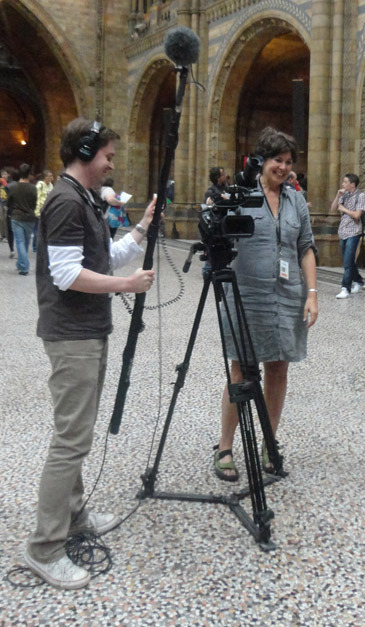 On arrival, we were taken to the gorgeous CentralHall, where a camera crew were set up near Dippy the Diplodocus (@NHM_Dippy). 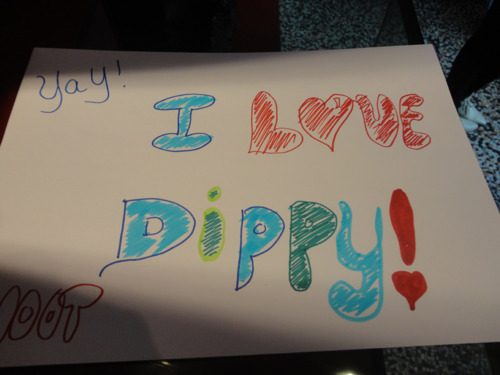 We were asked to make a sign (which I spent *way* too much time on creating..) then each of us were filmed saying why we loved Dippy and our memories of the museum. I babbled on and actually had to say it all again as my enthusiasm was a bit hurried for them. If allowed, I probably could have spoken for an hour on my love of the museum. I did mention something about wanting to marry it if allowed. When we were done, I still had another hour or so to look around before the museum closed. I immediately headed over to the Attenborough Studios and watched two very brilliant films. The second was David Attenborough: Life on Camera. He is such an inspiring person and the one person I really want to meet. The 15-minute film went through Sir Attenborough’s career which spans over many decades and just highlights what an amazing person he is. Best quote: ‘Inspiring a love of nature is the best way to preserve wild life.’ I feel that could be used for most cultural aspects. Afterwards, I went exploring. As much as I go to the museum, I always findsomething new and wonderful. This time it was the Human Biology exhibition which I happened upon after making a wrong turn (ok, so I was searching corridors and seeing where they went in hopes of … nevermind.) This exhibition was filled with laughter and lots of wonderful conversations in all different languages. There were very few displays that weren’t being viewed. Another turn and I was watching a brilliant film on a painting call Dodo Raphus cucullatus in the Images of Nature gallery. 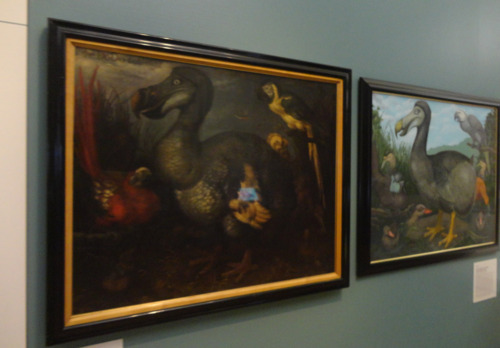 Apparently when the 17th century painter Roelandt Savery first painted the Dodo, he allowed for some artistic license with the shape of the Dodo. Fast forward to this century and the amazing and talented Dr Julian Pender Hume took the challenge to re-create the same portrait but using scientific knowledge to trim the bird to its appropriate size. Seeing the actual painting of the before and after in the Images of Nature was fascinating. As I continued my exploring, I ran across a wonderful statute of Sir Richard Owen, whose birthday it was. This led to a lovely conversation with a nice gentleman who was sitting near the statute at the time and queried why I was taking a photo. 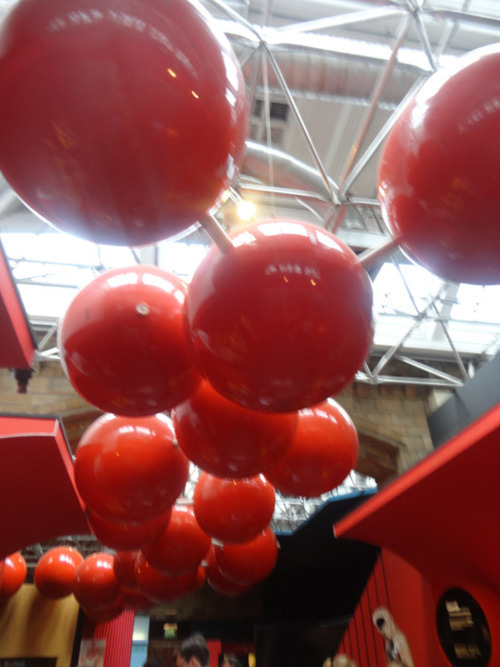 ‘That’s Sir Richard Owen – he’s the guy who made Natural History Museum happen and it’s his birthday.’ I replied. He looked the statute up and down and replied ‘Well imagine that, such an important guy but I only know of Darwin.’ I left feeling the same way – that maybe more should be done to promote greater awareness of the achievements of Sir Owen. I also stumbled upon the Tree Gallery – a wonderful architecturally gorgeous room with a powerful artwork called ‘The Tree’ on the ceiling. This is complimentary to the videos and displays you can read to learn more on the room and the artwork. 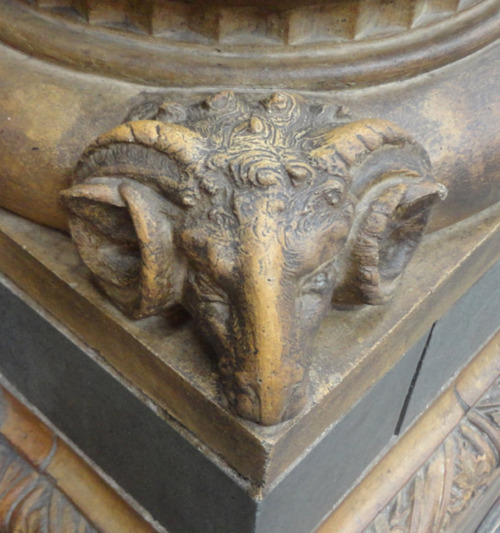 The remaining of my time was spent taking photos of the architecture of the fabulous building on a mini Terracotta tour. 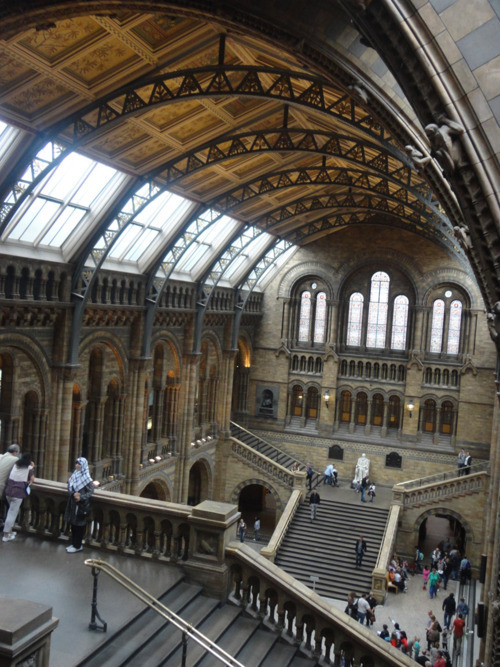 Natural History Museum is more than just a museum to me – the building is an amazing piece of work in its own right. 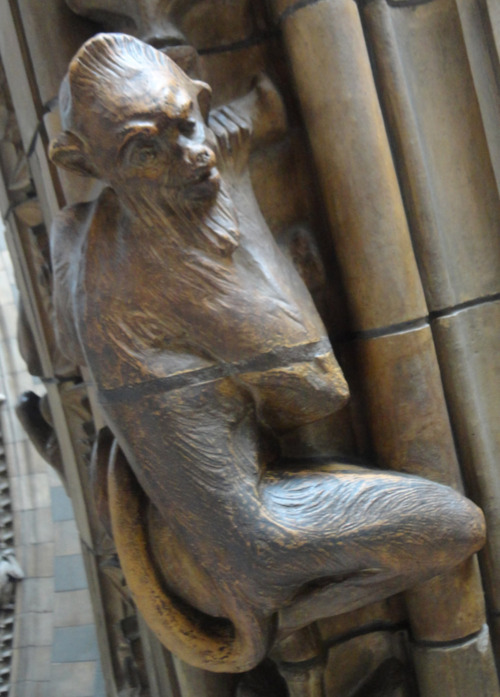 Did you know that the west side of the building has Zoological species and the East side is represented with Geological species? There are over 200 ceiling panels decorated with plants from around the world. 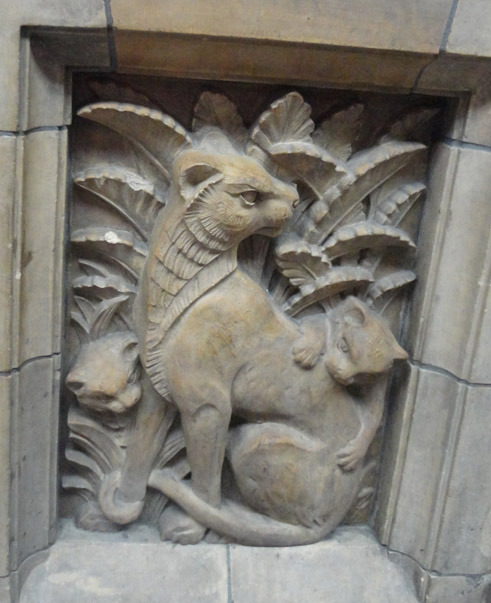 Next time you’re at Natural History Museum, try to do your own Terracotta tour – it’s amazing what you find when you look up.